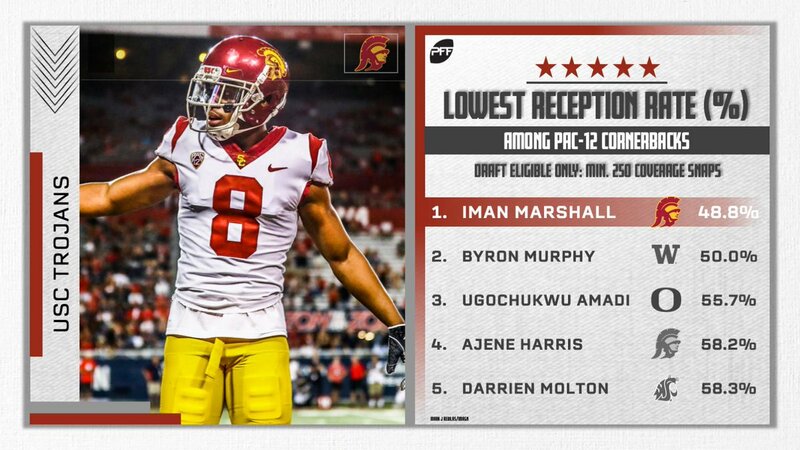 Iman Marshall allowed a mere 48.8% of his targets to be caught this season which led Pac-12 cornerbacks. People criticize Iman for being an aggressive corner, being too emotional and getting called for holding or a PI too many times over his career at SC. Yes that is partly true, however you have to admit stats don’t lie. He is underrated in my opinion. He should have played his college career at safety as he would have been much more suited for that position. Regardless, Iman has worked extremely hard during his 4 year at SC and has exemplified the meaning of “Fight On”. I hope he has success in the NFL. It was always my understanding that both Iman, as well as his father, continually insisted that he play CB during his USC career. That shouldn’t be a determining factor IMO, but none-the-less, it remains an issue, if true (a very widely held belief, I might add) with the entire USC staff, how it operates/operated and the program in general.